Provide comfort for the family of Gerald Bennett with a meaningful gesture of sympathy. Gerald Edward Bennett of Hamilton died on April 12, 2019 at home, with his wife of 58 years at his side. Gerald was born in Queens, New York on April 18, 1936 and was raised in Hoboken, NJ. As a talented baseball player, he won many awards. A Korean War veteran of the US Army, he served in the First Infantry Division (the Big Red One) and completed the US Army Airborne School (paratroopers). After his time in the service, he graduated from Rutgers University with a degree in Traffic Management and spent his career in the transportation and logistics field. He was a former parishioner and member of the Pre-Cana Team at St. Francis Cathedral in Metuchen and a current parishioner of St. Raphael/Holy Angels Church in Hamilton. 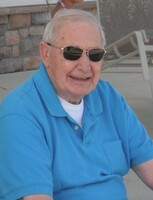 He served with the Merrill Park Little League from 1969-1977 as a Manager and a member the Executive Board. He was Grand Knight of the Knights of Columbus Council 6571 in Colonia and was a current member of Council 6213 in Hamilton. He was a member and Post Adjutant of the American Legion Council 63. He was a Trustee of the Fraternal Club of NJ, a philanthropic organization that donated scholarships to deserving students to attend Catholic High Schools. An avid New York Yankees and Giants fan, he seldom missed watching their games, many times to his dismay. Golf was a favorite past time, and he spent many happy hours on the links with his friends. He enjoyed traveling with his wife Barbara, whether it was going to the Jersey Shore, cruising the islands, or walking on a glacier in Alaska. Gerald was pre-deceased by his parents, Edward and Mabel (Yuengling), sister Ruth, and son Christopher. He is survived by his wife Barbara (D’Ascensio), sons Brian and his wife Sharon and Gregory and his wife Mary Pat, daughter Patricia and her husband Craig, grandchildren Tim, John, Michelle, CJ, Maya, and Martin, and Great Granddaughter Lily. The family would like to extend their grateful appreciation to his Home Health Aide Max and the staff at Seasons Hospice for their compassionate care and expertise. A Mass of Christian Burial will be celebrated Wednesday, April 17, 2019 at 9:30 AM at St. Raphael’s Church, 3500 S. Broad St., Hamilton, NJ. Burial will follow in St. Mary’s Cemetery, 1200 Cedar Ln., Hamilton, NJ. Family and friends may call Tuesday from 2:00 PM to 4:00 PM and 7:00 PM to 9:00 PM, and Wednesday morning from 7:30 AM to 8:30 AM at the Hamilton Brenna-Cellini Funeral Home, 2365 Whitehorse-Mercerville Rd., Hamilton, NJ 08619. To plant a memorial tree in honor of Gerald Edward Bennett, please visit our Heartfelt Sympathies Store.